Questions concerning use and development of the STXXL should be posted to the forums. 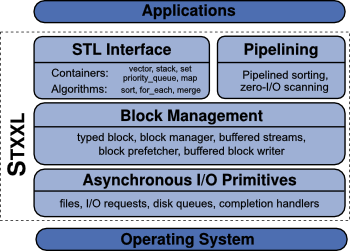 Version 1.3.1 (March 10, 2011) contains memory management, disk virtualization, prefetching, and so on, as the lower layers, and as part of the higher layer (pipelined) sorting with SMP and multi-core processor support, (pipelined) scanning and containers (vectors, stacks, priority queues, maps (B+Tree), queues, deques). Currently that sums to about 35,000 lines of code. Special features are maintained in up-to-date branches until they are merged into trunk. Until inclusion into trunk, the interface may change without further notice. Please refer to Installing from subversion for a description on how to build these branches. Added several new test programs. For a detailed list, please read the the CHANGELOG file.